Multi-effect processors have been around for decades, yet many guitarists, myself included, still prefer stompboxes when it comes to signal processing. I love the modular nature of effect pedals and I set up my pedalboard so that it is easy to switch pedals out for different playing situations. I use George L cables because I can cut them to the length I want, and I use the Pedal Power 2 because it does not care when I plug a positive ground effect into it, as long as I have the correct cable. One important factor in getting the most out of your pedals is putting some thought into the signal path, or the order that the effects are set up on your board. Most effects fall into the following broad categories: gain based effects (volume pedal, compressor, boost, OD, distortion, fuzz), pitch based effects (octave, harmonizer, wammy), modulation (phaser, flanger, chorus, tremolo), and time based effects (delay, reverb). I’ll put the wah into its own category. The only pedals that come before my gain based effects are volume pedal, wah, and octavia. I like the way that a volume swell increases the distortion as it’s turned up. I find that using the volume pedal after my gain pedals sounds less organic to my ear, but it’s worth trying on your own. I put the wah before my gain pedals because the wah is basically a variable filter and I find that it does a better job of filtering a clean signal. I’ve rarely enjoyed the sound of wah after gain in my setup. The octavia needs a clean signal to do its octave thing, plus it also has a fuzz built in, so it’s technically part of the gain section. I like to put compressors after fuzzes and OD, but you might try other methods, including putting compressors at the very end. 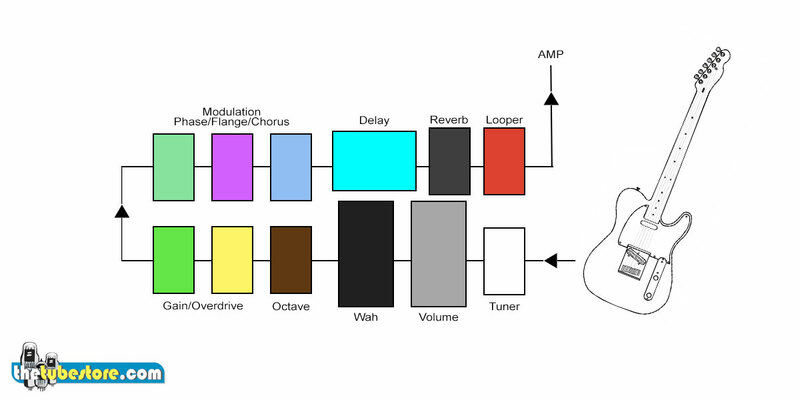 The basic idea here is that pedals that shape the tonal characteristic of your sound – filters, pitch shifters, and maybe also equalizers – should come before effects that alter the gain. Next in line for me would be modulation pedals. I will put them after the gain based pedals but before delays. If I’m using the POG (another pitch based pedal) it goes after the modulation. I love the POG and assumed it would go before gain based pedals but I found that when I am using POG with distortion or fuzz it sounds way more badass if the fuzz comes first. Again, it’s important to experiment. I prefer the sound of modulation pedals after distortion, but some prefer them before. If you’re going for the Eddie Van Halen sound you might prefer to put the Phase 90 before the distortion pedals. The last section of my signal chain is delay and reverb, in that order. 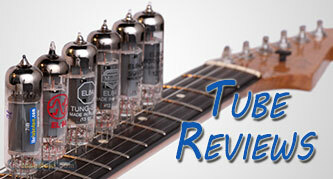 I can’t think of too many times when you would want those early in the signal chain. Basically everything that came before delay was shaping your sound, and delay is echoing that shaped sound. Delay and reverb are also effects that are usually added after the fact in the studio. If your amp has an effects loop you might run these pedals through that so that they come after the preamp section of your amp. I have a little looper that I love, and it goes after eveything (including time based effects) if I want to make loops with multiple parts that might have different effects on them. Sometimes, however, I want to make a loop and change the loop over time by manipulating effects manually. In that case I will put the looper first in the chain. It’s just a question of what my intent is. The current incarnation of my pedalboard is as follows – volume, wah, fuzz, boost, tremolo, chorus, POG, delay. My previous signal chain was larger – wah, volume, compression, octavia, fuzz, overdrive, chorus, tremolo, POG, delay. Keep in mind that messing with your effect order can create some really interesting sounds. If you have a delay pedal with separate outputs for the delayed sound and the dry sound, you could put an octave pedal on the delays only. If you put a reverse delay after your reverb and set the reverb for very long decay, you could get some really cool swells. Occasionally you will find that two pedals do not play well together. This could be an impedance mismatch. Try reversing the order or putting a pedal in between them that is not true bypass. Just remember to experiment and to start with a good solid dry sound. 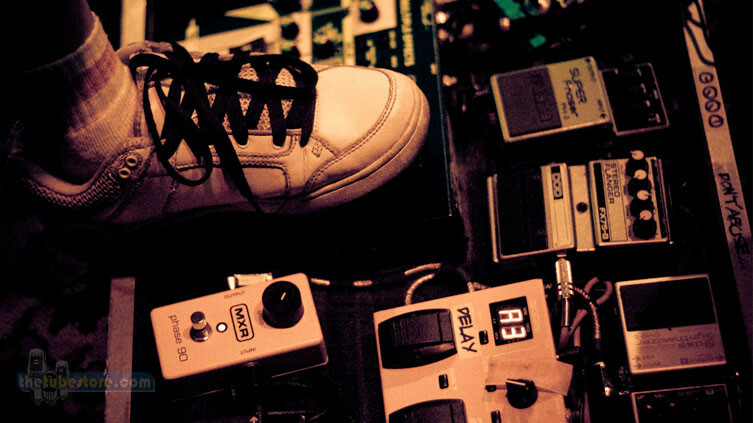 Pedals are there to enhance the sound you get from your guitar and amp. Happy tweaking! Feature photo courtesy of Daryll Jann (flickr).